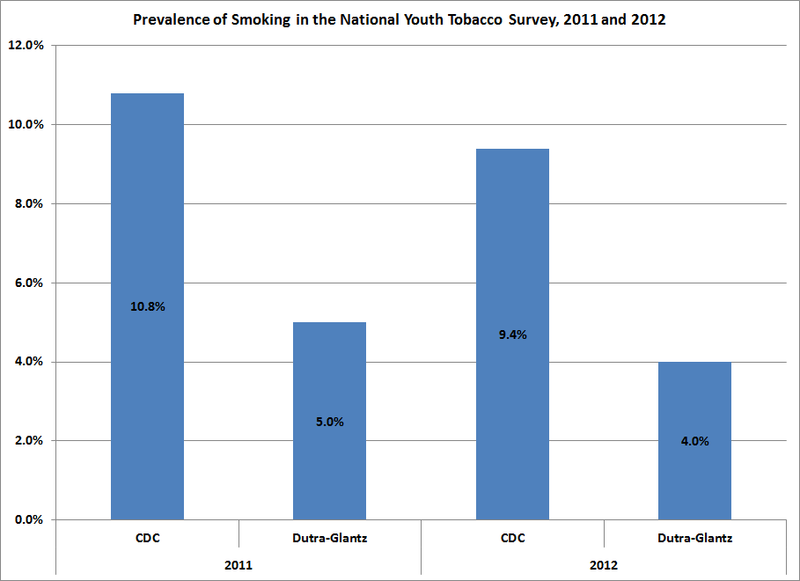 The National Youth Tobacco Survey (NYTS) has been abused on an unprecedented scale by anti-tobacco forces. First the Centers for Disease Control and Prevention released cherry-picked data, fabricating an epidemic of childhood e-cigarette use (discussed here and here). Then the New England Journal of Medicine refused to correct an inaccurate and misleading portrayal of e-cigarette and cigarette usage (link here). Now we have the work of the University of California San Francisco’s Lauren Dutra and Stanton Glantz, who a use a dizzying array of statistical analyses of the NYTS to argue that e-cigarettes are a gateway to cigarettes for youth (discussed here). The Dutra-Glantz study has been criticized by tobacco research and policy experts Clive Bates (here), Michael Siegel (here) and Carl Phillips (here). The fabrication was called out by the American Cancer Society and the American Legacy Foundation (here). After additional analysis, I have discovered major flaws in the Dutra-Glantz study that further undermine its credibility. First, it is difficult to accept their finding on smoking and e-cigarette use when, by all conventional standards, Dutra and Glantz have grossly underestimated youth smokers. They reported that current smoking prevalence was 5.0% in 2011, and 4.0% in 2012. This is less than half the prevalence reported by the CDC and other authorities (see chart). How could this have happened? It turns out that Dutra and Glantz invented a new definition of current smoking for youth: one who has smoked 100 cigarettes in her lifetime AND smoked on at least one day in the past 30. The standard definition for a youth smoker used by the CDC and all other authorities is anyone who smoked a cigarette on at least one of the past 30 days. Dutra and Glantz’s definition of current smoking for youth is also completely different from the definition they use for e-cigarette use (one day in the past 30). Dr. Glantz knows the standard definition for current youth smoking, because he used it last year in his report on e-cigarette use among Korean youth (abstract here). Valuable information in the NYTS surveys was obscured or ignored by Dutra-Glantz. While providing incomprehensible tables of odds ratios to inappropriately link e-cigarettes use and smoking, they omitted basic information related to e-cigarette use. The CDC data show that about 76% of current e-cigarette users are also current smokers, but the surveys contained additional information that helps interpret this e-cigarette and cigarette link. The surveys provide insightful data on students’ use of other combusted products (pipes, cigars and hookah). The following table places current e-cigarette users in four categories: (1) those who smoked only cigarettes, (2) those who smoked cigarettes and one of the other products, (3) those who smoked only the other products, and (4) or those who didn’t smoke. It is clear that the majority of e-cigarette users were users of multiple products. This is not surprising, as some youth tend to be risk-takers and experimenters. The table also shows that only a tiny number of students (13%) used e-cigarettes but no other smoked product in the past 30 days. That the significantly-flawed Dutra-Glantz study was published in the Journal of the American Medical Association Pediatrics is an indictment of the medical publishing industry’s peer review process. Unfortunately, journals generally under-scrutinize anti-tobacco submissions. After publication, journals tend to reject corrections, absent a glaring key error. But even that situation does not guarantee correction, as the New England Journal story shows (here).